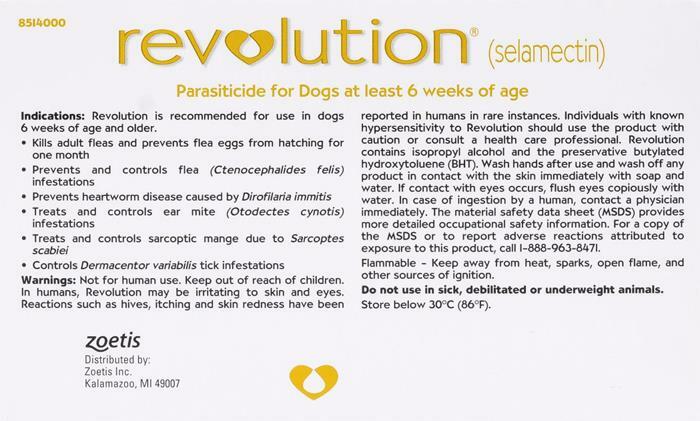 Revolution Brown for dogs prevents heartworms, fleas and other harmful parasites. Why buy 5 different treatments for 5 different parasites, when you can prevent them all with a single medication? Whether you’ve got a Min Pin, Pekingese, or Dachshund their tiny tails will wag with vigorous joy after a single treatment rids them of all their parasitic woes. Ingredient is the same, but density of the liquid is different for cats and dogs. So even a cat is the same weight as a dog, it doesn't mean they both need the same amount active ingredient. May be you can try Advocate / Advantage Multi for your cat. That product is good for any cat who is over 4 kg. Hi Liz, Yes, there are 6 pack Stronghold available. You can find them all of them at http://bit.ly/1pHHjT3. And yes, it is an identical product with a different branding. This product contains 6 single use tubes each containing 0.5 ml (60 mg.) of Selamactin. What happened to the expiration date? Please let me know the expiration date. Revolution (selamectin) is a topical parasiticide. We have been using this flea prevention medication for over 12 years on four legged fur baby Bashful and he has never had any problems nor do we have fleas in our home. Will not use any thing but revolution. I have used your products for years and they are excellent with good results. Thank you for keeping my dog healthy.